The annual Black Eyed Pea and Cornbread Cookoff will be held on January 1, from 10:00 a.m. to 6:00 p.m. at Torre di Pietra Winery, located at 10915 East U.S. Highway 290 east of Fredericksburg. Are you the King or Queen of black eyed peas and cornbread? Let’s see what ya got. 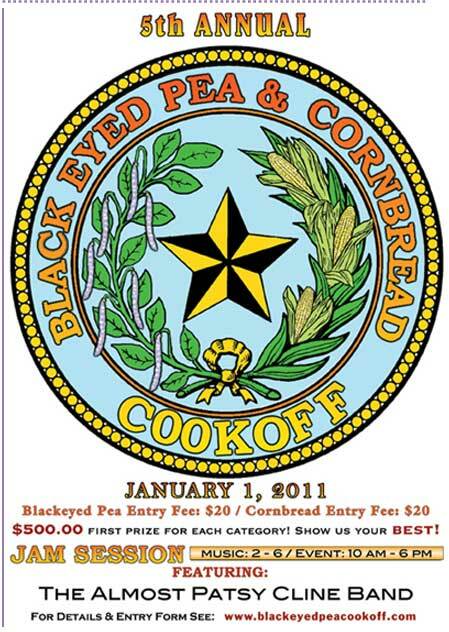 Black eyed pea entry fee is $20 and cornbread entry fee is $20, with a guaranteed $500 first prize in both categories. Live music by The Almost Patsy Cline Band from 1:00 – 5:00pm. For more information, call (830)990-9755.